Even those familiar with the hellish totalitarianism of North Korea can't quite muster up the kind of loathing toward Kim Jong Il normally reserved for his fellow Third World tyrants. The younger Kim, who inherited the role of President - and living god - upon his father's death in 1994, is viewed a relative lightweight, thrust unwillingly into a hereditary role, who would much rather be watching James Bond movies than overseeing a nuclear program. Kim's puppet portrayal in the 2004 film Team America: World Police, as a puffed-up dictator who's deeply, movingly lonely (sorry, "ronery") at heart, isn't seen as that all that far from the truth. Probably the best thing about Jasper Becker's chilling and compelling Rogue Regime: Kim Jong Il and the Looming Threat of North Korea is that it gives us one of the most vivid portrayals to date of the "Dear Leader", and it shows Kim Jong Il for what he really is: a calculating, Machiavellian tyrant who took to his role as Kim Il Sung's heir apparent with gusto, fighting off any and all internal challenges to his absolute rule and, in his father's dying years, even trying to steer him away from reform and détente with the outside world. Many Koreans even believe the son had the father killed, and while there is little evidence for patricide or almost anything else that goes on behind the scenes in North Korea, it's certainly no harder to believe than much of what we know about the Hermit Kingdom. One of Kim's former bodyguards is quoted as calling him "the richest man in the world," since there are really no limits on what the man can get away with. Anything the Dear Leader wants, he gets - the finest cognac, lavish palaces, luxury cars, beautiful women. If the country doesn't make it, it's imported, cost no object. And when he wanted a top South Korean film director and his actress wife to make movies just for him, he simply had them kidnapped. And then, of course, there is North Korea's nuclear program, supposedly stopped by a 1994 deal (brokered largely by Jimmy Carter) in which the West agreed to provide fuel, aid and even nuclear reactors to the DPRK in exchange for the country agreeing to play nice from there on out. It goes without saying that the North Koreans kept working on their weapons program in secret before the ink had dried - and it illustrates just how difficult, some would say impossible, it is to deal with a nation so hopelessly intransigent. Some reviewers have criticized Becker for not giving concrete solutions as to how the North Korean crisis can be resolved, but the sad fact is that there are no easy answers. Appeasement has failed miserably - but with the North Koreans openly threatening to turn Seoul into a "sea of fire" if their country is invaded, a military solution does not provide a definitive answer, either. Aside from the flaw which permeates nearly all books about the most secretive state on earth - a heavy reliance on defectors' testimony, which in most cases cannot be corroborated - Rogue Regime only touches briefly on one of the most troubling and incomprehensible aspects of the North Korea issue: the fact that many South Koreans, despite decades of provocation and terror attacks from their Northern brethren, remain extremely positively disposed toward Kim and his regime. Becker notes that Koreans are understandably bitter about their nation having been so arbitrarily divided after the Second World War; the Japanese aggressors, by contrast, got to keep their country whole. Meanwhile, feelings toward the thousands of American troops stationed in South Korea have grown steadily more negative over the years, for several reasons - their perceived support of the brutal dictatorship than ruled the country in the seventies and eighties, and incidents such as the killing of some young children just a few years ago, when they were struck by a U.S. military vehicle. So why aren't most South Koreans simmering with rage toward North Korea, whose government has kidnapped dozens of South Korean civilians, blown up a Korean Air passenger jet and dozens of government officials and even a South Korean First Lady in brazen terror attacks? Nationalism is funny that way, and even after Kim Dae Jung's "sunshine policy" of appeasement descended into farce, many young South Koreans simply do not want to believe their fellow Koreans can really be their enemy. Just like the Korean peninsula itself, the South Korean populace remains hopelessly divided, and the subject merits further examination. 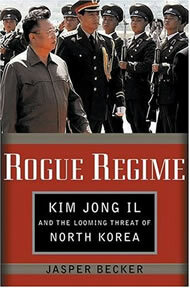 But Rogue Regime is absolutely essential reading, along with Kang Chol-Hwan's gulag memoir The Aquariums of Pyongyang, for people who want to understand North Korea and its mysterious, unstable leadership. We no longer have the luxury of assuming the regime is willing or able to reform its economy or foreign policy, or that the problem will somehow take care of itself. Above all, we must let the people of this closed, cultish society know that they deserve to be free, and that we will not tolerate their plight any longer. Damian Penny is the author of the widely popular blog Daimnation!.